If you are unfamiliar with guitar tablature (most of the time called "TAB"), let's set you straight before moving into the main discussion. 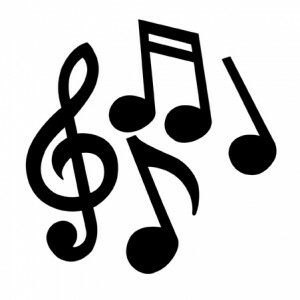 TAB is a way to notate musical notes and chords that is specific to guitar. (There have been tablature schemes invented for other fretted instruments too, but you'll have to find another article for lute TAB.) Just know that TAB was invented before the guitar. It almost died out but was revived after WWII by thousands of new guitar players. The first thing to know about TAB is that it's "visually analogous". That means that it paints a picture that roughly corresponds to your guitar neck. Instead of telling you what notes you'll be playing, letting you decide what strings, frets, and fingers to use when playing those notes, TAB gives you a visual "how to" rather than the note names. You can see why TAB would become popular with guitarists. It offers a mental "shortcut" to learning. If you're looking at TAB, it means that some other guitarist took the actual notes and did some mental interpretation for you ahead of time to produce that TAB. 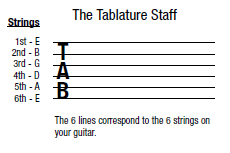 There are 6 horizontal lines in guitar tab (one for each string, counted from top to bottom). The top most line represents the highest pitched string on your guitar, the first string. The lowest line represents the 6th string (the lowest pitched string). I'm gonna call those "string lines." There... I said it. If you see just one number by itself, that's a single note to be played by itself. If you see several numbers stacked on top of each other, that's a chord. You'll also see vertical dividing lines that cut through all 6 string lines. Those divide measures in the song. If the song is in 4/4 time, then all the notes between two measure dividing lines will total to exactly 4 beats. There is one major drawback built in to regular guitar TAB. There's no indication built into the scheme for how long any given note or chord should be played. That presents a big problem IF you've never heard the song before. If you've heard it before, you can usually figure out the timing using nothing but TAB and your memory of the song. Now let's get back to our original topic: Comparing guitar TAB to what is called "standard notation" (notes-on-a-staff). First of all, once you learn to read notes on a staff, you can actually play songs you've never heard and you can work songs out from NON-guitar sheet music. That's a nice advantage if you have a sister who plays piano and has amassed some song books or sheet music to songs you want to learn. Second, there's that timing issue we talked about with TAB. With standard musical notation, you don't have that disadvantage. The timing of each note is built into its shape. A whole note (a note lasting a whole measure of 4 beats) looks visually different from a half note (lasts only 2 beats). The whole note looks like an egg. The half note looks like an egg with a stick growing upward from its end. So everything you'd need to play a song is communicated in standard notation... except one thing: Which fingers do I use to push down which strings? In this way, TAB is superior to notation, precisely because it is visual in scheme. Now don't get me wrong here... TAB does NOT tell you where to put your fingers. However, because you see a visual representation of which strings to play and which frets to press, you get a head start on which fingers to use. Your hands will quickly get a knack for using the easiest combination of fingers when looking at TAB. What I strongly suggest is that you learn both! There are enough early pay-offs to learning TAB that it's worth diving into right away. You get quicker "musical gratification" from TAB. But once you've learned that, go ahead and start learning to "read notes" as they say. The world will open up to you once you do.